This tuna, cappers and lemon juice pasta salad is one of those dishes that reminds me of my youth. Picnics, summer parties, and quick summer lunches at home were all frequently characterized by a pasta (or a rice) salad. I can not give a specific origin of this recipe, and I cannot even say that it’s a typical Italian dish; I just know that my mom always made it for my brother and me, so here I am, sharing it with you! 1) It is super fast to make (not more that 15 minutes). 2) Few ingredients are required. 3) It is pretty light (not too high in calories). 4) It’s refreshing and delicious! 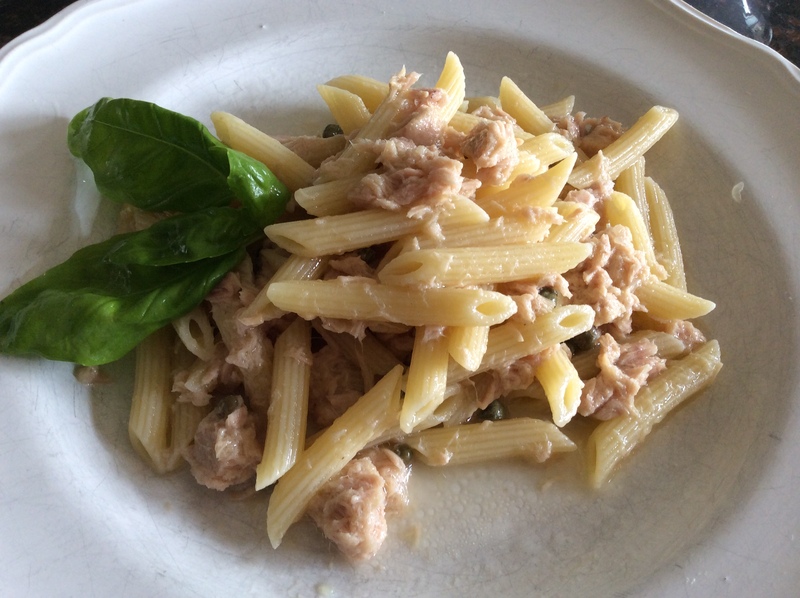 The cappers and lemon juice in the pasta salad help to balance and tone down the typically strong taste of tuna, and the lemon juice acts as light dressing, giving to the dish a pleasant, fresh aroma- perfect for summer! I can confirm that this dish is ideal for picnics, cook-outs, or a lunch box, and can be prepared a day before. The ingredients do not spoil quickly (like many of the typical American salads made with mayonnaise), so it’s a safer option when food will be sitting out in the heat for a bit. It can be prepared as a cool dish, like a salad, or still warm immediately after mixing all the ingredients together. I personally love the second option, but this is just my humble opinion. Why don’t you try it both ways and let me know which is your favorite one? Bring 3 quarts of water to boil, add 2 tbs. of coarse salt (for more details, check out “How every Italian cooks pasta”) and the penne rigate (or whatever kind of pasta you chose). When the pasta is cooked (according to the package instructions, or your desired degree of tenderness) drain and RINSE IN COLD WATER. Mix all the ingredients together, and serve. Or, if you wish to serve it as a cold pasta salad, place it in the refrigerator until ready to serve. Here we go- now you’re off to your summer picnic to relax and enjoy the company of good friends and great food! Enjoy!! TIPS: If you like GREEN OLIVES, chop a handful of them and add it to your pasta salad… it will be even better! < Strawberry jam sponge cake roll: the perfect summer treat!